The bomber was piloted by 1st Lt. James E. Jatho, flying from an air base in Pantanella, Italy, as part of the 779 Bomb Squadron, 464 Bomb Group, 15th Air Force that took part in the massive attack on the enemy refineries. It included 605 heavy bombers escorted by 334 fighter planes. The attack was the heaviest raid on the Romanian oil refineries during World War II, according to the U.S. Air Force. 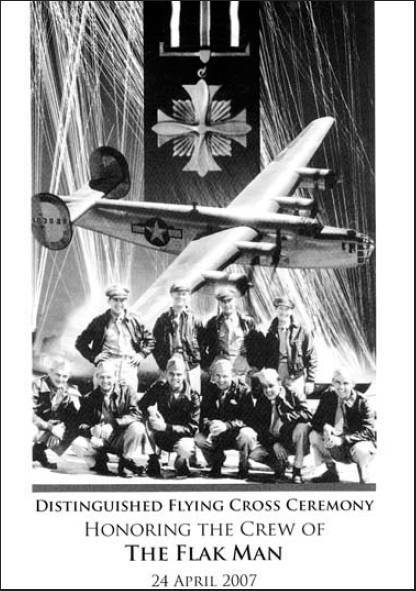 “Their B-24 encountered heavy anti-aircraft fire that severely damaged the plane and caused the loss of one engine,” the accompanying booklet distributed at the ceremony notes. “Despite a damaged plane, pilots Jatho and 2nd Lt. George N. Croft managed to hold the course. “After dropping their payload, the crew’s plane began losing speed and altitude and soon lost contact with the rest of their squadron. The plane was successfully guided across the Adriatic Sea to their base without further damage to the bomber or injuries to the crew,” the booklet says. Two days later, on July 17, 1944, “The Flak Man” and the entire crew were shot down in another bomb raid over Weiner Neusdorf, Austria. Tech. Sgt. William A. Magill was killed in that attack and the other eight members of the crew became POWs. Holding a 2-inch by 2-inch diary made from the blank sides of Chesterfield cigarette packages, 91-year-old Fish squinted through steel-rimmed glasses the other day at the penciled scribble on the tiny pages he wrote long ago. He kept the cigarette packages hidden in his flight suit while held in Stalag Luft-4. “At 10:18 a.m., July 16, 1944, our bomber was attacked by eight German fighters southeast of Vienna, Austria,” he wrote. “After 20 minutes of fending off the fighters our ship was shot down in flames along with two or three of the enemy planes. “I bailed out, along with the rest of the crew, and was captured at 8 p.m. I was taken to a German radar station outside the village of Paulsen, Austria,” Fish wrote in his little book. “There I found the pilot, copilot, bombardier, nose gunner and a waist gunner who had already been captured. “The next morning we were moved by train to a town near Frankfurt, Germany where we were interrogated. Eventually some of us ended up in Stalag Luft-4, a POW camp run by the Luftwaffe, for non-commissioned officers in northern Poland along the Baltic Sea,” he wrote. Life in the stalag wasn’t too bad except for one guard they named “Big Stoop,” who beat up on the prisoners, and they lacked adequate food. “We ate brown bread in the morning that was mostly sawdust, thin cabbage soup for lunch and thicker cabbage soup for dinner,” Fish recalled more than six decades later. “Just before Christmas 1944 conditions in the camp started improving when a Red Cross delegation made a check of the camp. “Just about then the Russian Army was forcing the Germans to retreat. We were required to leave the POW camp and begin a long walk through the countryside. It was January, terribly cold with snow on the ground. “The roads were clogged with civilians refugees headed east. We had to walk through the fields away from the advancing Russian troops. We slept outside a lot. On Valentines Day 1945 we were sleeping on a hill in the open when an ice storm hit,” Fish said. “I ended up with dysentery, and two days later I passed out as we were walking by a German farm that was farmed by Polish slave laborers. The Polish laborers took me in, cleaned me up and fed me potatoes. Two days later I was over my dysentery and was back on the road once more. I was able to catch up with my fellow POWs who were still struggling down the road,” he said. 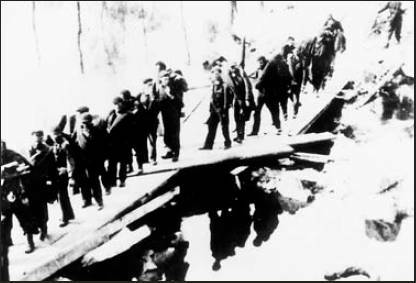 By late April what was left of the hungry, exhausted and dying POWs had been on the road for almost four months. Forced by their German guards they walked aimlessly along trying to stay out of the clutches of the Russians. “On April 25, 1945, we reached the Torgan River in Germany where we slept along the bank. The next morning we built a bridge of boards across the river. We were met by the American Timberwolf Division advancing northeastward on the other side,” Fish said. The 104th Infantry Division, called the Timberwolves, was commanded by Maj. Gen. Terry Allen, who originally commanded the Big Red One, the American 1st Division, in North Africa and Sicily earlier in the war. “We were loaded on trucks and taken to an air base at Halle, Germany. We stayed at the base for a while. It was absolute anarchy until we were flown to ‘Camp Lucky Strike’ near Le Harve, France,” where Fish eventually boarded a ship for the U.S.
After he was discharged from the Army, he continued his life as an industrial engineer, his chosen profession before the war. He and his wife, Shirley, eventually retired to Englewood. This past New Year’s Fish received an unexpected call from Edward McNally, “The Flak Man’s” bombardier. What Fish later learned was somehow McNally discovered that years earlier the long-dead tail gunner of their B-24 had been awarded the Distinguished Flying Cross. The bombardier began lobbying for similar decorations for the entire crew of their bomber. With the assistance of 2nd Lt. George Croft’s, the co-pilot’s widow, they were successful. 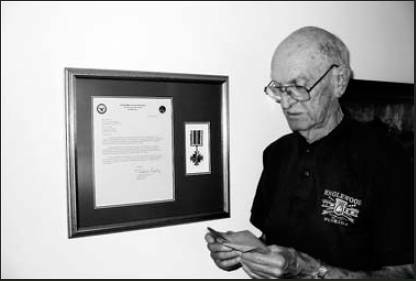 “In a situation like this, if a bomber crew receives the DFC, it’s for the efforts of the entire crew, not an individual in the crew,” Fish explained. Sure enough, a short time later a letter from the Air Force arrived at Fish’s home. The formal announcement read: “The Chief of Staff of the United States Air Force Gen. T. Michael Mosley with the Honorable C. W. Bill Young, U.S. House of Representatives, presiding requests the pleasure of your company for the presentation of the Distinguished Flying Cross. The asterisks indicated which honorees are deceased. “It was wonderful, the Air Force held a cocktail party when we arrived, a dinner for us, provided us hotel accommodations and flew us up there,” Fish said. “My wife, Shirley, our four children and nine grandchildren came with us to Washington to see me receive the commendation. Altogether our family had 19. There were three busloads of relatives who attended the ceremony at the House Office Building. At least 150 people altogether. “Gen. Mosley pinned the DFC on me and the two other bomber crew survivors. Then Congressman Young handed me a folded American flag. It was a great day,” the old soldier said. The Distinguished Flying Cross is awarded for bravery to aviators and crewmen. It is just below the Medal of Honor in its importance. In this case it was awarded to the crew of a B-24 heavy bomber 63 years after a raid on the Ploesti, Romania, oil refineries during World War II. This story was first published in the Charlotte Sun newspaper, Port Charlotte, Florida on Sunday, June 10, 2007 and is republished with permission. Click here to search Veterans Records. Former Tech Sgt. Jay Fish of Englewood, who served in the 779th Bomb Squadron, 464th Bomber Group, 15th Air Force in Italy during World War II, received the Distinguished Flying Cross during a special ceremony recently at the Capitol in Washington, D.C. Some 60 years after his B-24 “Liberator” squadron took part in a raid on the German oil refineries near Ploesti, Romania, nine former Army Air Corps members received their DFCs. The six-decade-late commendations were the result of efforts by U.S. Rep. Vern Buchanan, R-Sarasota. On July 15, 1944, scores of American heavy bombers made a daylight attack on the enemy refinery complex, causing heavy damage. Fish’s bomber sustained severe damage, knocking out one of its four engines. The following day, after the Ploesti mission, his B-24 crew was shot down over Neusdorf, Austria, by enemy antiaircraft fire. One crew member died in the crash, while the remaining eight were taken prisoner. They spent the remainder of the war in a POW camp. Fish was among three surviving crew members who were honored. The other six members of the crew received the medal posthumously. In addition to Fish, medals were presented to 1st. Lt. James E. Jatho, 1st Lt. Edward L. McNally, 2nd Lt. George N. Croft, 2nd Lt. Theodore D. Bell, Tech Sgt. William A. Magill, Staff Sgt. Frank G. Celuck, Staff Sgt. Robert O. Speed Jr. and Staff Sgt. Daniel P. Toomey. The Distinguished Flying Cross is award to servicemen who distinguish themselves by heroism or extraordinary achievement while in flight. It is just below the Medal of Honor in importance. You can e-mail Don Moore at moore@sun-herald.com. Age 93, died peacefully at home on Tuesday, Aug. 31, 2010 in Englewood, FL, his daughter Cynthia at his side. He was born Nov. 29, 1916, in Rochester, Ny., to Edna Taylor and J. Arthur Fish. After high school in Niagara Falls, New York, he continued his education at Cornell University. He graduated from the University of Alabama in 1938 with a degree in mechanical engineering and played in “The Million Dollar Band”. Drafted from his job building war ships, he served in the Army Air Corps as a Flight Engineer flying out of North Africa and then Italy. He participated in the bombing of the Ploesti oil fields, for which he was awarded the Distinguished Flying Cross April 24, 2007. The day after that flight, his plane was shot down over Austria and he was held as a prisoner until the end of the war. When the Allied troops neared his prison camp, Stalag Luft IV, the 10,000 airmen POW’s were marched, unsupported, for 86 days and 600 miles from Feb. 6,1945 to May 2, 1945, through Northern Europe. This experience resulted in a life long admiration for the book “Catch 22”, a disinclination towards visiting Europe as he had “walked across it already, twice,” and a belief that his survival was a great gift. He married Shirley McCoy in March 9, 1946, and soon began a family which includes Cynthia McKinnon (Elson Miles) Flagstaff, Ariz., Susan Follansbee (William) Pittsburgh, Pa, Kathryn Madia (John) Grand Island, Ny., and Kenneth Fish (Jennifer Hays) Fort Lauderdale, Fla. He was employed for 32 years as a mechanical engineer by the DuPont Company, eventually becoming Plant Manager of the Niagara Falls Plant. He was a mentor to young engineers and made life long friends during his working years. He learned to play the bagpipes for the retirement party of Harry Stafford, a dour elderly Scotsman, coworker and neighbor. Harry teared up as Jay played “Scotland the Brave” although Jay was never quite sure if it was joy in hearing a beloved tune or distress at Jay’s lack of finesse. As a lifelong sailor, Jay was a member of Sandy Beach Yacht Club, Grand Island, Ny., where he served as Commodore in 1954, Atlantic Highlands Yacht Club, Atlantic Highlands, NJ, and Youngstown Yacht Club, Youngstown, Ny. where he served as Commodore in 1974. He was a life long member of the Power Squadron. After retirement, Jay and Shirley spent part of the year sailing in the Bahamas, particularly in the Abacos.The births of three grandchildren were announced by ship to shore radio call from the Conch Inn in Marsh Harbour. When cruising became too much, Jay and Shirley settled year round in Englewood, FL, where he played saxophone, clarinet and bassoon in local bands, including the No Name Band, and North Port Band. He was predeceased by his parents, his brother Kenneth, and his wife, Shirley. He is survived his children and by ten grandchildren, Taylor, Peter and Timothy McKinnon; Benjamin Follansbee, Kate Follansbee Junger (Logan), Christopher Follansbee; Patrick, Eric and Lucas Madia; Kalea Ann Fish; and one great-grandchild, Cooper Junger. A memorial gathering will be held at his home, 1957 Fairview Dr., Englewood, 34223 on Friday, Nov. 26, 2010 from 1 to 3. Donations may be made in Jay’s honor to the North Port Band c/o Dr. Dennis Silkebakken, 1897 Silver Palm Rd., North Port, Fla. 34288. Printed in the Buffalo News November 24, 2010. A great tribute to elderly men who were once very young…and brave. Koji – It’s my privilege to write these stories.